What if you ask someone if they are thinking about suicide, and they say, “yes”? What do you say? Often when people express daunting thoughts about suicide they expect to be judged. They anticipate that others will react in negative ways such as fear, anger, minimizing, or shaming. When they hear a genuine expression of gratitude, often they are put at ease. This honoring response creates a safe space to move into next steps. Starting here is starting from a place of dignity and respect. Because rejection and discrimination are real outcomes for people living with mental health conditions and suicidal thoughts, reassurance can be very grounding. Too often after disclosure, people who are suicidal experience the “hot potato effect.” Well-meaning people (and this includes many therapists) get scared upon hearing the news of someone’s suicidal thoughts, so they bounce people to someone else, who then does the same. Each time the person in despair is passed along to someone new to “help” they must start over, telling their painful story, recounting symptoms, and so on. All the time no one is actually helping them solve problems and recover. The hot potato effect is demoralizing and often feeds into a narrative of “I am worthless and unlovable” or “no one can help me.” In effect, bouncing people around worsens the suicidal crisis rather than helps to resolve the crisis. Working in partnership lets people know they have an advocate, someone who is in their corner. Another way to express this part is the idea of reciprocity. “I am helping you just as you would help me.” This statement lets the person know they are not a burden, but that this is just what friends and family do for one another out of love. Finally, this step emphasizes the importance of an empathic connection. In order to reach a state of empathy, you must reach inside your own memories of experiences and tap into something you have gone through that may give you insight into their current emotional state. By doing this, you will be more likely to respond to them as you would want to be treated. 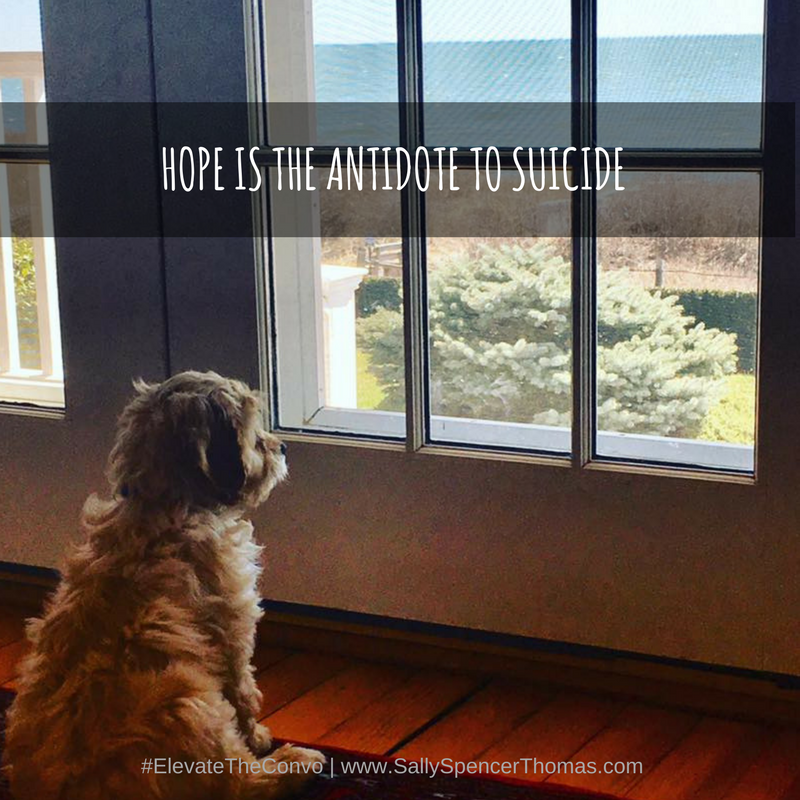 Hope is the antidote to suicide. The most effective way to offer hope is through action. With compassion and collaboration you can help them consider their options for developing their personal plan for healing. Offering hope is NOT about championing change (e.g., “You better see a doctor!”) or proposing reasons for living (e.g., “But you have so much to live for!”). Offering hope is about helping a person craft their own plan for safety and wellness (e.g., WRAP) by providing possibilities to help them figure out what is best for them. Other resources to engage in this step might include your local mental health center, employee assistance programs, or HelpPro.com’s suicide prevention therapist finder resource. Suggest that you call or meet with these resources together, at least as a first step. Before ending the conversation, make a plan to reconnect. It turns out following up is one of the most effective ways to prevent suicide. Sometimes these communications can be “checking in” to see if the person has hit a roadblock. Other times “non-demand caring contacts” are all that is needed. What are non-demand caring contacts? Just what they sound like. No asks. No telling what to do. Just “I’m thinking of you” messages. They could come in the form of pictures, “what I appreciate about you” thoughts, or even funny cat videos. By following up, you are letting them know they are not a hot potato, but that you are there standing shoulder to shoulder, walking with them out of the darkness together. When someone discloses to you that they are having thoughts of suicide, treat it as a gift. They have invited you in to a vulnerable part of their world, and you are a guest in this space. While it can be very scary to hear that your loved one is in such a desperately painful situation, your presence can make a huge difference in their recovery. So, when they say “yes” to the suicide question, take a deep breath and follow these steps. You might just be the one to help them save their own life.